This year I’m interviewing 10 amazing women in project management. My blog started 10 years ago partly as a way to increase the visibility of women working on projects, so I’m excited to be able to showcase the voices and careers of some inspirational women. Today it’s Caroline Crewe-Read, Head of Corporate Projects and Programmes at Historic England in the UK. Her job has taken her to some of the most iconic and historic locations in the country. One of her major programmes put the foundations in place for a new way of managing the conservation of historic environments – a legacy she can surely be proud of. Caroline, how did you get into project management? 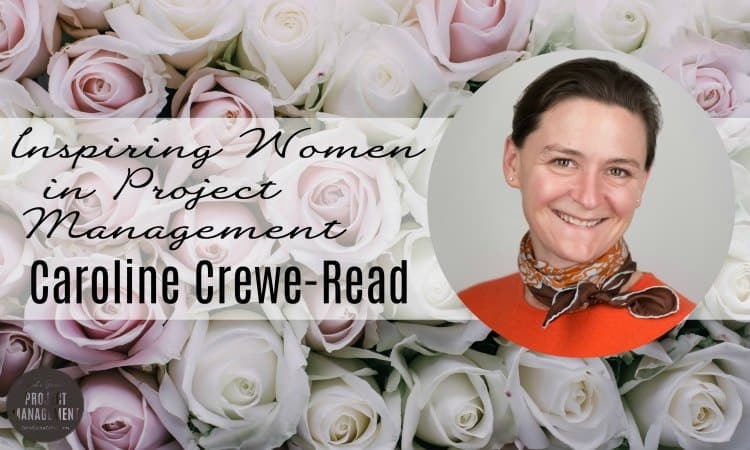 My first exposure to project management was during my early career with Accenture when I worked on large IT projects and programmes for a variety of clients in the financial services sector. Trained in methodologies bespoke to Accenture meant however that I had a very narrow focus and approach and so looking back I would say that I didn’t really ‘get into’ project management until I was working for English Heritage. I was between roles and my recognised skillset led to me being asked to establish and manage an exciting new capacity building project called the Historic Environment Traineeship (HET) Scheme. With a short time frame in which to set up the scheme and recruit the first set of trainees I recognised the necessity of following some sort of best practice in my approach, and it was then that the proper project management seed was sown. What do you like best about project management? Bringing order to chaos! I enjoy helping people to realise their visions and to turn strategy into practice. It is only relatively recently that I have started to recognise how necessary this skillset is – for a long time I thought those with the big ideas were the individuals who brought most value to an organisation. Now however I truly recognise that those visionaries need individuals around them who can grasp their goals and turn these into reality. Your work at Historic England means you must work in some amazing places. What’s the best place you’ve ever been to as part of your work? It has to be Stonehenge. I joined English Heritage (as it was known then) in 2003 to lead the fundraising campaign for an earlier iteration of the Stonehenge Project. This aimed to achieve, and a decade on delivered, a long-held ambition to reunite the stones with key elements of their surrounding landscape and to create a new world class interpretation space and visitor facilities. My academic area of expertise is British prehistory (notably stone circles!) and so to have had the opportunity to work on such a unique project was extraordinarily special. It has also provided me with many stories on which to dine out, including stewarding at the midsummer Solstice, a marquee dinner at the Stones in midwinter and escorting Joan Rivers around the site during a spectacular thunderstorm! Prioritising. Each of the projects and programmes I am currently working on are an important corporate priority, but which is more of a priority than the next?! Do you think prioritisation is an issue specific to you or is it something that anyone at your level managing multiple initiatives would face? I think the challenge is a common one unless you are lucky enough to work for an organisation that recognises the benefits of portfolio management and prioritises its programmes and projects accordingly! 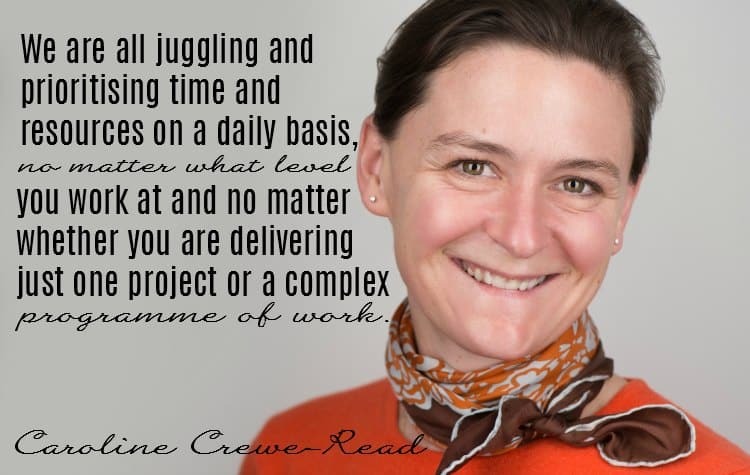 I think we are all juggling and prioritising both time and resources on a daily basis, no matter what level you work at and no matter whether you are delivering just one project or a complex programme of work. What’s the one thing you wish you had known when you started in your career as a project manager? I wish I had known it was a professional route to follow whilst considering career choices during my undergraduate degree. I’m a big fan of structure, and being offered a formal route to qualification and then practical application would certainly have appealed. Whilst I did gain significant project experience whilst working for Accenture this was more by accident than design. I lasted just four years before returning to university to study for a Master’s degree in Archaeology! It is only over the last decade that I have started to follow a more structured learning plan, qualifying first in PRINCE2, then as an Association of Project Management Practitioner (APMP) and most recently as a Practitioner in Managing Successful Programmes (MSP). Do you have any tips for women wanting to do a similar role to you? Generalising is often unwise but I do think that women have a natural gift for relationship-building and for engaging openly and constructively with stakeholders and colleagues which stands us in very good stead when considering one of the key criteria for the successful delivery of projects and programmes. So my tip would be to take confidence from this, recognise that this may be the USP which marks you out from colleagues and build robust stakeholder engagement into any programme or project plan. Do you have a favourite project, past or present? I have two, if that is allowed! The HET Scheme, which I mentioned earlier, is very important to me as it was a project that was all about people. Not just any people either, a bunch of extraordinarily talented individuals who were given the opportunity to grow and develop during a two year work placement scheme with English Heritage and who have gone on to achieve amazing things in their subsequent professional careers. However the delivery of the English Heritage ‘New Model’ programme stands out for me as the most exceptional programme I have been involved with to date. In April 2015 this programme enabled the Historic Buildings and Monuments Commission for England to change its brand name from English Heritage to Historic England and divide its activities between two organisations: the English Heritage Trust, a registered charity licensed by Historic England to manage its National Heritage Collection of more than 400 historic properties and Historic England, which will continue as the public body responsible for championing the historic environment and providing expert statutory advice to central and local government in relation to listing and planning matters, providing guidance to stakeholders caring for historic structures, undertaking research, grant making and managing an extensive historic archive. Why does that project hold a special place in your memory? The New Model was the biggest change programme to have been delivered at English Heritage since its establishment in 1983. As Head of Programme Delivery I was given an incredible opportunity to help secure a capital investment of £80m from HM Treasury that will provide a firm financial footing for the on-going conservation of the National Heritage Collection. Through the separation of English Heritage into two organisations, the programme also ensured the future delivery of historic environment expertise across the country, championing our wider historic environment and encouraging its constructive conservation for future generations. Personally the programme exposed me to the workings of Whitehall and the Major Projects Authority whilst also providing me with insights into the governance challenges of co-directed change. Experience is gained hour by hour, week by week, year by year. It is this experience, together with the identification and analysis of lessons and learning through training that helps you grow in confidence and ability as a project and programme manager. Caroline, how do you balance work and life? Any tips? The perennial problem. I have three children, aged 10, 8 and 5, and I’m genuinely not sure ‘balance’ is something I achieve easily, if at all! The delivery of the New Model programme required a ‘full-time plus’ commitment but since the completion of the post-implementation review I have been lucky enough to reduce my working week to the equivalent of four days per week, which I spread over five. This enables me to be around more for the children during term time, although if I’m honest the travel requirements of the role mean this doesn’t always work perfectly! Experience is gained hour by hour, week by week, year by year. It is this experience, together with the constant identification and analysis of lessons and supplemental learning through formal training that I believe helps you grow in confidence and ability as a project and programme manager. There is always more to learn but in 2016 I intend to face my delivery challenges with confidence, knowing how far I have come since first dipping my toes in the water of project and programme management! Follow Caroline on Twitter @ccreweread and find her on LinkedIn. Caroline’s photo is ©John Cassidy.